I am such a devout chocoholic that I actually get a bit irked when someone says that chocolate just isn’t their “thing”. I don’t want any part of their thing if that is the case…but that sounds wrong doesn’t it? In truth, I shouldn’t be so surprised that this non-chocolate cake is total deliciousness. Why shouldn’t it be? After all, apple is paired with melt-in-your mouth caramel and what pairs better with apple than caramel? Well…maybe just a few other cohorts should be mentioned in the “what goes smashingly with apples” list…1)Cinnamon 2)Raisins and 3)Nutmeg. Don’t you agree that these guys, along with apples and caramel, are just such a happy little party together? 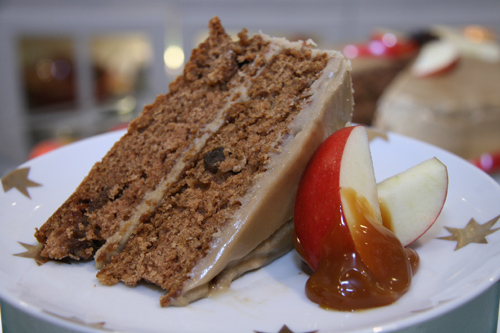 Absolutely ALL of these apple partiers are found in this spice cake with the rousing bonus of DARK RUM! The raisins basically marinate in the rum while you make the cake, then the bottom layer of cake gets brushed with rum as well. Holy WOW! I’ve stolen that catch phrase from a fellow blogger, Leah of The Seven Hills Collection, and I have decided to use it with abandon lately. It seems to describe a lot of my life both bad and good. Feel free to use it at will, however it’s not really mine to give away, but I am kind of a thief anyhow so I may as well go whole hog or whole blog. Blogging is thievery most of the time anyway. We are often borrowing good bits of most recipes to share with the world, but most of us are forthright enough to let you know that we weren’t the geniuses who invented the recipes. We are just the geniuses who can improve upon it and share our improvements and comments with the world….or at least with our own handful of fans. This recipe looks so little like its original form from Cooking Light that I believe I can rightfully claim it as my own and tell you with pride that I am the genius who invented this recipe. My muse was the title from Cooking Light, but as usual, I have fattened it up a trifle, gotten it a bit soused and sent it here to my electronic world of the blogosphere. I hope you get a chance to make this Fall inspired spice cake, but make sure only the cake gets soused and not the chef. For a gluten-free version of this recipe go to Chaya’s Comfy Cook. To prepare the cake: Grease two 9 inch cake pans with butter. Make sure to butter the sides and the bottom of the pans and then flour both pans and tap out excess flour over the sink. Heat oven to 350 degrees. 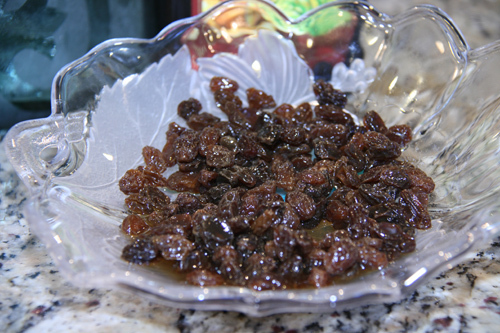 Soak raisins in 2 T. of the dark rum while you make the rest of the cake. Put granulated sugar, brown sugar, butter and apple sauce in the bowl of a stand mixer fitted with a paddle attachment. Cream together and add egg and vanilla and then mix again. In a separate bowl sift together flour through salt. Dump half of the flour mixture into the butter mixture and combine. Then add the other half of the flour mixture. Combine again. Take raisins out of rum and add raisins and chopped pecans to batter and incorporate into the batter. Pour the batter evenly into the prepared cake pans and bake for 30-35 minutes or until toothpick comes out clean. After cooling the cakes for about ten minutes, take the cakes out of the pan and cool on racks. Cool completely before preparing icing. To make the icing, combine the sugar, milk, butter and salt in a medium saucepan; bring to a gentle boil over medium-high heat, stirring constantly. Do not walk away from the pot, this icing burns easily. Simmer for about 5 minutes and until slightly thick, stirring occasionally. Remove from heat. Put powdered sugar in the bowl of a stand mixer fitted with the whip attachment. Slowly pour slightly cooled icing into the powdered sugar. Beat together a little of the icing at a time, but start slowly, the liquid is hot. Add vanilla and mix. Let cool about about 5 minutes. Icing will thicken as it cools. Icing is still pourable when it is cool. Take a sharp bread knife and carefully even out the bottom layer of the cake, exposing the crumb of the cake and place on cake plate or stand. I like to line the outside of my cake stand with foil so that when the icing runs down the sides, I can peel away the foil later and the plate and cake look clean. 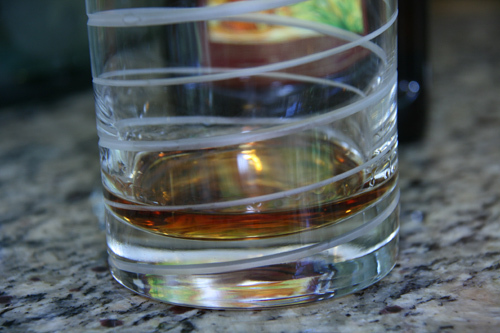 Brush bottom layer of cake with 2 T. rum. Pour about 1/3 of the icing on the bottom cake layer then place second layer on top and pour the remaining icing over the top. Spread the icing with a spreading spatula or butter knife and smooth out the sides, reserving a little icing for after refrigeration of the cake. Refrigerate your cake for an hour before peeling off the foil. Then with the reserved icing, you can smooth out the sides and any other mistakes. Serve with caramel dipped apple slices for garnish. Oh, my. You had me at dark rum. I wonder if there’s a way I can do this in cupcake form. I’m so glad you reposted this! You know I love drunken anything! This is perfect for the season; and I like that you didn’t overpower it with the spices, just enough to give it a delicious fall fee and aroma…as I’m assuming your kitchen must have smelled awesome! Wow… caramel icing? Apple cake? YUM!! I’m definitely bookmarking this to try when I get apples! You say spiced rum cake and I say two slices please. 🙂 Great recipe. Two slices it is then! Thanks! Hmmm, I don’t even like raisins, but rum soaked? Come to papa. (You probably don’t want to use that catchphrase.) The icing looks amazing. Great recipe! No Greg, I don’t think I’ll use that catchphrase…oh my. The icing is VERY addictive…VERY. Rum and raisins is the winning combo, so to include it in a cake alongside all the other ymy spices and apples is pure genius! PS If you don’t feel like extra calories, IKEA sells those apple cinnamon candles – fall and winter and apple pie and Christmas in a candle! Cake with a built in cocktail! Does it get better than that? The cake looks fabulous! Hmm, every now and again an absolutely winner of a recipe comes along and here it is today! I do love me some chocolate, but I also love me some fall-inspired desserts. That frosting probably wouldn’t even make it onto the cake…it just wouldn’t get past me and my spoon! Oh man, this looks fabulous! Would love to enjoy a slice of this with a hot cup of coffee (or hot apple cider!). Geni, can I exchange my Caprese salad with a slice of this cake? Wow is right! 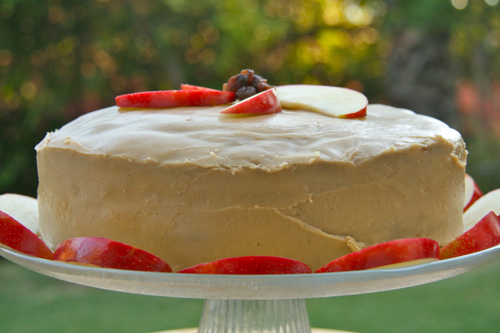 Applesauce, lots of spices and rum…all topped with a caramel icing…perfect for Fall. That caramel icing looks heavenly! it may be dense for cupcakes, but it would then be perfect for muffins. MY definition of muffins. I always think a lot of muffin recipes are really just cupcakes disguised as muffins anyway. too cakey for my liking…. I like them rustic and sort of ‘hunky’ batterwise… firm and dense…. like most hunks…hahhahahah….. perfect!.. 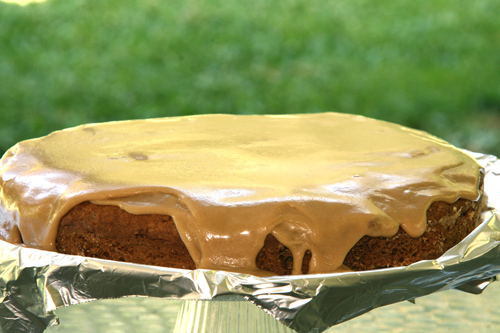 Life is too short not to each this applesauce cake and caramel icing.Mouthwatering, taste tingling descriptions of a wonderful looking cake…I’m up for dessert! Holy smokes does that look like fall perfection! Apples, caramel, and rum?!? Tastiness. Oh, I remember seeing this one. I love apple cake, but ibe never had a boozy one. That’s probably the best idea ever. Thank you so much for mentioning me! I really appreciate it. Apples, caramel and cinnamon…I’m coming on the next flight! Hi, Geni..first time visitor through Yvette. Congrats on your nomination. I can see how Yvette is swept away by your recipes – yummylicious! (A catch phrase of my own..hee,hee). The re-post is well worth it! I love apple and spicy anything, and oh, by the way, I agree about chocolate- I love it!! How sweet and I do love FALL!